The universe conspired against me; it wanted me to be a Beatles fan. I was due to be born in September, 1973. But for three weeks that June, a song by a former Beatle stood atop the Billboard charts. For two weeks, it was Paul McCartney’s “My Love,” from Wings’ Red Rose Speedway album. The following week, it was George Harrison’s “Give Me Love (Give Me Peace on Earth),” the first track from Living in the Material World. I was born when Harrison’s song was atop the charts, to my everlasting relief; I’ve never really cared for “My Love.” Was I born to be a Beatles fan, then? Born over two months early, in a week when a song by the former Fab Four stood was the #1 song, it’s not hard to disbelieve; I simply had to be born under a Beatle sign. I’ve sometimes said I’ve forgotten more about the Beatles than most people ever know. I don’t know if that’s exactly true, but I do have a vast collection of books and CDs on the Fab Four. Not just official CDs, either; I’ve collected a fair few bootlegs of the band over the years. I don’t have a favorite Beatle, though I tend to listen to George Harrison and John Lennon more than I listen to Paul McCartney and Ringo Starr, except for times when it’s the other way around. I have taken the Beatleology personality test — this tells you which Beatle you’re most like — and the way I scored out wasn’t surprising. I’ve also put together what I consider (because I’m unbiased) the ultimate alt-universe 1970 Beatles album, assuming they didn’t break up — Hot As Sun. Suffice it to say, I like the Beatles. Yes, I do. Not only was I born to be a Beatles fan, I must have been born to be a Chicago Cubs :cubs: fan, because the Peanuts comic strip the day I was born was about Charlie Brown and his obsession with baseball, specifically the rituals and routines that baseball players go through. There’s no obvious link to the Cubs :cubs: in that strip, but Charlie Brown’s baseball team itself is a lost cause, and his appreciation for the career of Joe Shlabotnik is well-known. Just as Shlabotnik taught Charlie Brown disappointment at an early age, the Cubs :cubs: taught me that there’s always next year, that anyone, in Jack Brickhouse’s famous phrase, “can have a bad century.” If the Beatles instilled in me the power of love, peace, and understanding, then the Cubs taught me the power of hope. Hope, of course, is the power of the Blue Lanterns, and if I were a Lantern, I would be a Blue Lantern. Unlike the Beatles or Charlie Brown, though, the Blue Lanterns aren’t familiar to millions, just thousands. The Blue Lanterns come from comic books, specifically DC Comics’ Green Lantern series, where aliens and humans patrol the galaxy, dispensing justice and order. For decades, there were only Green Lanterns and Yellow Lanterns, but recently other Lantern colors appeared — Red Lanterns and Orange Lanterns and Blue Lanterns. I would be a good Blue Lantern. That I would compare myself and identify myself with a comic book character type says something — I like comic books. Though it’s actually more than that. I don’t just like comic books. I work in the comic book industry. My first job, out of high school, was working in a comic shop in Bridgeport, West Virginia. Fifteen years later, a job opportunity came up in Baltimore, working in the industry, writing for a trade publication. I get to immerse myself in comic books and geek culture, interviewing creators like William Shatner and writing about Where the Wild Things Are or Bloom County or, in one strange case, Strawberry Shortcake. I don’t limit my writing to pop culture and comic books. Besides writing about politics or life or whatever subject strikes my fancy here on this blog, I also write fiction and non-fiction. I’ve written some Star Trek fiction, and I’m probably best known for “Make-Believe,” an original series story that was published in the 40th-anniversary anthology, Star Trek: Constellations. I’ve also written for Doctor Who, specifically the mind-blowing short story “The Spindle of Necessity. I’m proud of both stories; “Make-Believe” won the Psi Phi Award for Best Short Story, and “Spindle” was chosen for a “Best Of” Doctor Who anthology. I’ve also written some articles for Star Trek Magazine, and I’m working on a mainstream novel. While Star Trek is my media science-fiction first love, Doctor Who is my media-sf true love. A strange thing for an American to say, especially one that has never been to the UK, but it’s true. I’m a natural Anglophile, I think. I’ve read enough English literature that, to quote Sherlock Holmes, “my font of English has been permanently defiled,” as I cannot tell sometimes the differences in spelling between an American English and an English English word. And I find British sitcoms far more entertaining than American sitcoms. Blackadder is a particular favorite, and I absolutely adore Father Ted. However, I think that Arrested Development is better than any Britcom, and Frasier is usually on par. My tastes in music also tend to be Anglophile. It’s not just the Beatles. I enjoy The Who a great deal. The Yardbirds, too. Led Zeppelin, strangely, doesn’t do a lot for me, and I’ve never seen the appeal in the Rolling Stones. Closer to these times, I loved Oasis — and Noel Gallagher’s departure left me gutted for weeks. One discovery that I’m grooving to of late is The Leisure Society. But my main band right now is Manchester’s Elbow, and after years of thinking I’d never see them live, I saw Elbow at a gig in DC in August 2009. American bands? There aren’t many I go out of my way to listen to. Carbon Leaf is one. Green Day is another. My first memory of Star Trek is of “The Slaver Weapon,” that classic episode of The Animated Series where Spock matched wits with the Kzin. My first Star Trek movie was Star Trek II: The Wrath of Khan, which my father took me to see for my ninth birthday. The first Star Trek novel I read was James Blish’s Star Trek One, the first Star Trek novel I bought was Vonda McIntyre’s novelization of Star Trek III, the first original Star Trek novel I read was McIntyre’s The Entropy Effect, the first original Star Trek novel I bought was Margaret Wander Bonanno’s Strangers From The Sky. Interestingly, while I didn’t buy Strangers until 1987 (and on a vacation to Knoxville, Tennessee, in an outlet mall at a newsstand, odd the things you remember), I did have a nearly complete set of Walter Irwin and G.B. Love’s Best of Trek series at the time (and have the complete set now). In retrospect, the Best of Trek books weren’t the best way of getting a Trek fix, but for my ten, twelve year-old mind they were wonderful for broadening my sense of Star Trek. Could I do the same sort of list for Doctor Who, since it’s my true love? Firsts and everything? First episode is “Pyramids of Mars” in 1982 or so, though I know I’d seen some other Tom Baker episodes before that. First Doctor Who novel wasn’t until the early 90s and that was Andy Lane’s All-Consuming Fire. The firsts for Doctor Who don’t fix themselves in the mind the same way the firsts for Star Trek do. Besides subjects such as these, what other interests do I have? Atheism. Much to the chagrin of family and relatives, I’m an atheist. Though I was raised as a Methodist, for a variety of reasons it never “stuck.” In many ways, I credit Carl Sagan with this; COSMOS had such an effect on my young, impressionable mind that I didn’t see a need in my world for religion or gods. Non-theism is growing in the United States, and I think that by writing about it, I can help to further the process of social acceptance of atheists — and perhaps help someone else who hasn’t told their friends and loved ones out of fear of rejection to see that life goes on. Politics. I call myself a “Teddy Roosevelt Republican.” Roosevelt’s politics, as shown in his 1912 campaign for President, were progressive. Unfortunately, Roosevelt’s brand of Republicanism has grown extinct; today’s Republican Party wouldn’t recognize Roosevelt or Abraham Lincoln or Ulysses S. Grant as Republicans. Ergo, I generally vote for the Democratic candidates. I firmly believe that politics and policy should have a moral dimension. The intolerance and the anti-Americanism of today’s Republican Party I find abhorent. I find politics interesting. I find the process interesting. And so I write about politics. Writing. I sometimes talk about the things that I’m writing. Occasionally, I’ll even excerpt what I’m working on. Maybe it offers insight into the process. Maybe it’s just marking time. Occasionally, then, this blog is a writer’s journal. My writing process isn’t straightforward, and I have to work a lot of things out in my own mnd when I commit words to paper. Work. 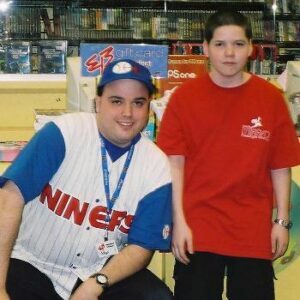 At times in my life, I’ve been a store manager for Payless ShoeSource and for EB Games. I worked on the docks for Urban Outfitters in their warehouse. I worked for ElderHealth, a Medicare provider. I worked as a high school debate coach. Now, I write marketing and sales copy in the comic book industry. Blogging. I use WordPress, an open-source PHP platform to power this website. I started using WordPress in 2004, after a few years of using Greymatter. I like tinkering with the WordPress code. I’m not a great designer, though, so creating a website design would be beyond me. I can, however, do a little PHP programming, such as the Shire Reckoning plugin for WordPress, which generates dates in using the Hobbit calendar from The Lord of the Rings. Fonts. Some people have suggested I have a problem with fonts. Just because I have more fonts on my computer, and more links to font websites, than any person can possibly ever use is not the sign of a problem. I don’t have a problem with fonts. I can quit them at any time. I do, however, have strong opinions about fonts. I despise Comic Sans, I refuse to use Times New Roman. Give me Palatino and I am happy. I will settle for Caslon. And contrary to what the Veterans of Foreign Wars thinks, I did not storm the beaches of Iwo Jima sixty-five years ago. That’s my story. Allyn Gibson. Writer of various and sundry things. Baltimore resident. Chicago Cubs fan. Amateur historian. Political junkie. Gadfly. Any of this interest you? Then stick around; you might find something you like. As well as your love of Who/Sci-Fi, I noticed you’re an Elbow fan. Excuse the shameless plug, but wondered if you might like to check out our site at http://ElbowFans.ning.com?